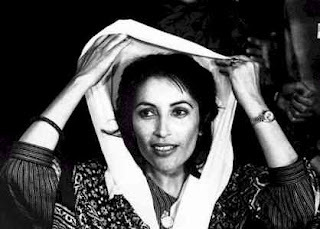 Benazir Bhutto was killed, by vermin, for the Benazir Bhuttos of the world are invariably killed by vermin. I have been expecting it ever since she returned to Pakistan, how could she live, she stood for moderation, for real justice, for freedom, for goodness. I can't believe it though, I cannot believe she's dead. This is exactly why I stopped watching the news, I cannot cope with this, I cannot cope with the brave new world we are shaping for our children and our children's children. I cannot cope with the world we're shaping for ourselves. I am not only crying the death of a remarkably brave woman, real courage is increasingly scarce (and how much harder it must be to willingly put your life at risk when you're a mother), how many of us can claim to have really helped change the world, I am mourning the death of yet another giant on whose shoulders we were all allowed to stand and glimpse hope. Pakistan may seem distant but it is all our backyard now, extremism threatens to swallow us all, we have all been maimed. We are all less now. Sadly, the writing was on the wall. I, too, am shocked - but not surprised. You are so right, though, bravery and courage are hard to find in politics these days. Bless her for the attempt. This is incredibly awful...no one should ever have to risk their lives to serve in politics. I know, I know. I read about it yesterday and still can't believe it. I don't know why but I had this feeling in my soul that she'd not be touched, as if by magic or divine intervention or whatnot. Not her. It's always her and him and them and the rest of the good ones. She had the courage to believe that she was right, and to live that way. She had the courage to face the evil cowards who wanted to kill her...and they did. And I fear for what is to come. But nobody please mention the danger, the actual, precise danger. Nobody please mention the killers, or their motives. Let's keep it nice and anonymous, let's not point fingers. Let's all sit there, cowering in fear, bemoaning the dear departed. And wait for the next atrocity, so we can moan and cower some more. FYI: I am sad too.